Benicia, CA. May 7, 2010 – à la cards is a finalist in the LOUIE awards for the third year in a row. The first line is high spirited whimsy from the award winning and renowned illustrator, Michael Storrings. Michael lives and works in New York City. His line of hand blown glass ornaments features happy urban scenery and holiday celebrations sold in Bloomingdales, Saks Fifth Avenue and other major department stores and retailers throughout the United States. Michael Storrings collaboration with à la cards is eye popping three dimensional urban scenes of famous international and American cities filled with frolicking animals and happy people. à la cards has also collaborated with Sterling Hoffman, an award-winning Napa Valley, California fine artist, resulting in an exciting new card format. Sterling Hoffmann’s beautiful and exciting nature scenes are set to wood veneer paper as postcards. These works of art are suitable for framing. à la cards offers a third new card line of soulful expressions suitable for all of your significant life events. These cards are elegantly engraved on high spirited color card stock. This card line appeals to the traditional minded and those who desire deep social expression with a modern kick. 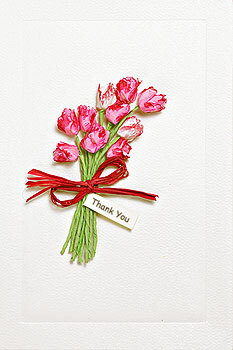 à la cards still offers it’s original line of three dimensional handcrafted floral greeting cards.